The scientists doing researches on Big Bang Theory have at last agreed with the fact that the eternal dance of Lord Nataraja coincides with movement of atomic particles on the earth and they have beautifully coined the term for the dance of Lord Nataraja as “Cosmic Dance”. But this had been identified thousands of years ago by the forefathers of Hindu Philosophy. With the long tradition and rich heritage, they had the highest reverence for Lord Nataraja and adored Him as the Father of the Dance of all forms. 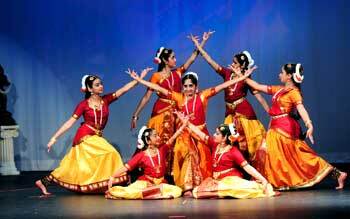 The dance performed by the God is called “Aanandha Thaandavam”. Yes, obviously, dance is a form of art which is mesmerizing, wonderful and amazing. So as a gesture of gratitude, the grand festival Natyanjali is arranged in the Lord Nataraja Temple, Chidambaram, Tamil Nadu. Though it was originally introduced in the Nataraja Temple, it is widely followed in almost all major Shiva Temples. Natyanjali means offering to the God in the form of Dance Performances. Natya means Dance and Anjali means offering. This festival falls on the day of Maha Shivaratri in the mid of February and continues for more than a week. Maha Shivaratri is a day when the devotees of Lord Shiva are awake throughout night chanting the verses about the God and worship Him. On this auspicious day, dance performances reflecting the different cultures and traditions of India are performed by the Senior Gurus, Seasoned Learners, Experts as well as the beginners. Lakhs of devotees gather in the temple premises for worshipping the Lord on Shivarathri day, the different forms of dance namely Bharatanatyam, Kathakali, Kuchipudi, Kathak, Odisi and Chhau and the like. Hundreds of dancers offer their dance performances to the Lord to seek His blessings. The Aadhi Yogi and the founder of Dance Lord Shiva is believed to enjoy the performances and bless His devotees with His Benevolence. Come and enjoy the oldest tradition of our country to please the God with an art form which can never be seen in any part of the world. Natyanjali on Maha Shivarathri invites you for an amazing experience !